Hangzhou citizens got a chance to watch and understand the latest developments in artificial intelligence and robotics which are slowly seeping into our daily life. Artificial intelligence is now the buzzword not only in science, but in almost all walks of life. “To advance application of AI in real economy” has officially been written in a report delivered at the 19th Communist Party of China National Congress which ended on October 24. In fact, AI is taking up our daily life with a speed faster than many could have imagined. Ordinary citizens got a chance to look at the latest development in artificial intelligence and robotics at a recent exhibition, which was held between October 20 and 23. Sixteen companies showcased their flagship products and technology at the Hangzhou International Expo Center. A four-legged robot at the exhibition caught the eyes of many visitors. The robot “Chitu,” weighing 75 kilograms at a stand-up height of 0.8 meter, was developed by a start-up team from the College of Control System and Engineering, Zhejiang University. 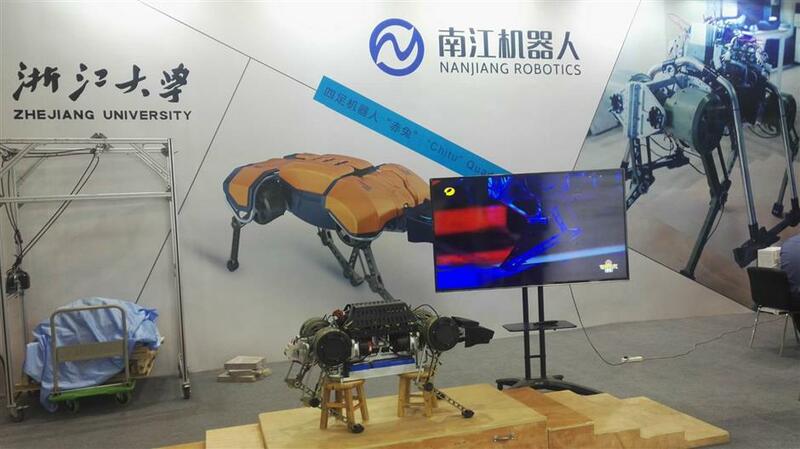 It took the team two years to launch a second-generation robot with funds from Nanjiang Robotics, a local company that produces wheeled warehouse robots. Chitu is likely to be used for safety patrol, post-disaster rescue operations and counter-terrorist practices. “The robot can walk on slopes, gravy roads and other complex surfaces,” said Zhao Yidong, a member of the project. “Compared to traditional wheeled robots, it can also jump and climb 17-centimeter-tall stairs." Its walking speed can reach up to 1.5 meters per second — as good as grown-ups. It is electronically powered and capable of working for 40 minutes outdoors. In May this year, the quadruped robot won the “Global Student Design Showcase” in NI Engineering Compact Award, an annual engineering and science conference hosted by National Instruments Corporation in the US. While Chitu is still in the lab, some local companies are already reaping profits by mass producing household/commercial robots. Hazzi Robotics, for example, brought three types of products — Xiaozhi, a dancing robot, while Rongbao and Jubao are used for shopping guidance and reception. Chitu, a quadruped robot, has been developed by a start-up team from Zhejiang University. 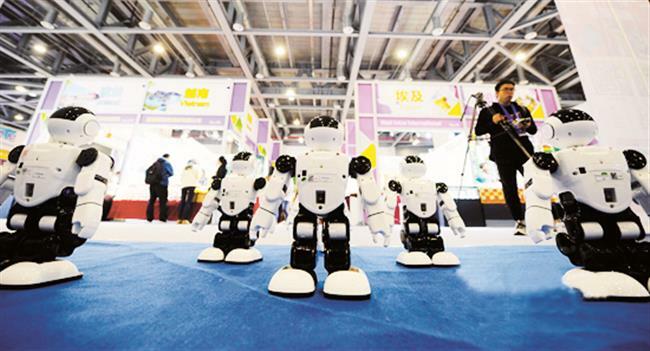 A salesperson at the exhibition told Shanghai Daily that the prices of robots ranged from 3,680 yuan (US$555) to 200,000 yuan each depending on the requirements of the customer. In another booth, a staffer from Baidu, one of the top three Internet companies in China, was demonstrating how to interact with a built-in DuerOS home entertainment system. DuerOS is a speech based interactive AI system initiated by Baidu in July this year in the hope of connecting every device. By using a remote control that accepts sound input, users can “talk” to their TV and command it to switch on and off or skip the intro of a program. The process actually involves several AI or AI-related technologies including speech recognition, facial recognition and natural language processing. Meaning, once equipped with DuerOS, a device will be able to understand the human language and react with corresponding actions. The same system can be transferred to cars, stereos, wearable devices or even home appliances. The DuerOS also works as an open platform that allows developers to submit their own AI applications. Beside commercial uses, AI technologies are also applied in government administrations. Another exhibitor, the Hangzhou-based Enjoyer Group, presented its comprehensive intelligent solutions for public medical care, traffic policing, environment monitoring, etc. Tapping on the big data collected from the city’s traffic police unit, it works out the best plan for the traffic light durations at each intersection, which greatly eases the problem of congestion on road. The project is a collaborative one with the Alibaba Group. The exhibition was a part of this year’s West Lake International Expo and the third World Leisure Expo, which kicked off on October 20, and featured 33 major events including forums, exhibitions, festivals and other leisure activities. Roger Coles, chairman of the World Leisure Organization, told Shanghai Daily that he was amazed at the city’s fast development in facilities and infrastructures. As it opens up with more tourism opportunities, the city would be recognized and appraised by more foreigner visitors. Xiaozhi, dancing robots developed by Hazzi Robotics, perform at the exhibition.